Heat 2 tablespoons of the olive oil in a large frying pan over medium heat. Add the minced herbs, bay leaf, and vegetables, along with ½ teaspoon of the salt and the nutmeg. Cook for about 5 minutes, until the onions are translucent. Add the pepitas and cook for a minute, until their color changes from green to beige. Take off the heat and remove the bay leaf, reserving it for the next step. In another pot, combine the 2 cups water with the reserved bay leaf, the remaining teaspoon of salt, and the remaining tablespoon of olive oil. Stir until the salt is dissolved, then bring to a boil. 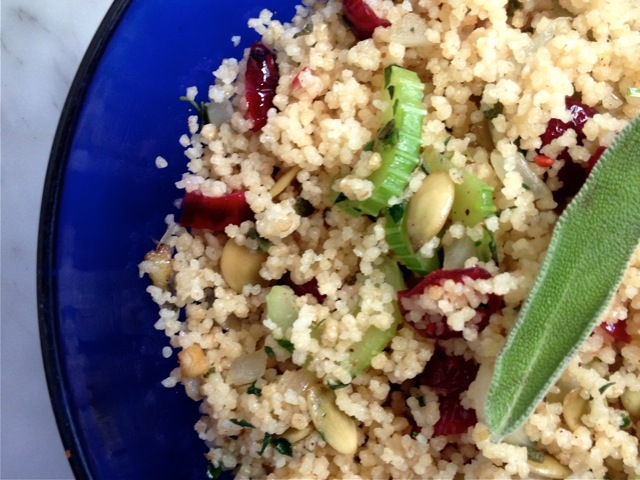 Turn off the heat, add the couscous and cranberries, and stir until combined. Cover the pot and allow the couscous to sit for 5 minutes, until all the liquid is absorbed. When the 5 minutes are up, uncover the pot and fluff the couscous with a fork. Add the herb-and-seed mixture, and stir. Season to taste and serve immediately.